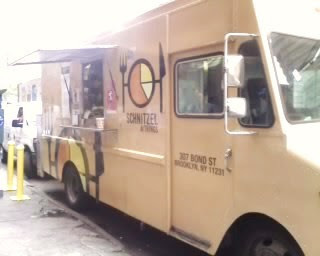 I was very excited to find out on Twitter that the Schnitzel & Things truck would be setting up shop for lunch in Flatiron today, so I grabbed a friend and went to check it out. In addition to the food, which was good and reasonably priced, we got an eye-ful of an altercation between the truck proprietor and some tough guys from Eisenberg's Sandwich Shop. The Eisenberg guys were arguing that the truck was stealing business from their store while the Schnitzel truck, parked there for one day only, countered that he had a right to be there and that they weren't catering to the same crowd anyway. Then said crowd got into the mix a bit as well. I am somewhat torn on this one. I think the explosion of food trucks throughout the city is great. It provides a cost effective way for food entrepreneurs to hang their own shingle and introduces New Yorkers to new dining options. That said, I am concerned about the effect this trend could possibly have on long established businesses like Eisenberg's, which has been in its spot since 1929. I am also deeply troubled by the fighting, and in some cases violence, that has occurred between the new trucks and incumbent street cart vendors who feel like their long held turf has been encroached upon. The capitalist in me thinks it just comes down to competition and being a neighborhood institution doesn't insulate you from the free market's formidable forces. Let the people vote with their wallets on that one. The more compassionate side of me knows these Halal vendors and mom and pop's have been around for ages and have mouths to feed too. So what to do? Normally a proponent of limited government interference, I am going to break out of my mold and say Mayor Mike, you need to get involved. You can't issue all these truck permits to generate revenue for the city and then just turn them loose in the wild with no rules. This hurts both the trucks and the businesses they locate next to, all of whom are city tax payers. So make some order out of this urban food jungle. We all have to eat, but unlike in the bush it need not be kill or be killed. I don't know about "good and reasonably priced" It's $9 for breaded meat (which wasn't bad) and two very skimpy sides. The sauerkraut that's really old cole slaw and austrian potato salad that's not much of a potato salad at all. The cream will rise to the top. If Eisenberg's makes a superior lunch at a comperable price they will get the business. If not, the truck will win. The trucks are a new development in the past few years, to be honest I'm not sure how I feel. On the one hand they provide a huge upgrade in food quality over (most) street carts who sling dirty water dogs and overpriced sodas (nothing like watching a vendor hustle a tourist on a $2 can). What the carts lack in my opinion is the charm of a NYC street vendor- charming in the same way an old subway car is. It seems these days anyone can dress like the lead singer of weazer and open some food truck sporting some new food trend. As a free market consumer - of deliciousness! - it's your responsibility to prevent truck competition from driving - ! - oldtimers out of business: Eat two lunches. Here's what I think. I'm all for food trucks. I like the variety and the convenience. That said, there is an ordinance on the books in NYC which says an outdoor food vendor must be 25 feet away from any store selling like items. Let's not forget that the food trucks and street-meat guys are not paying rent and their share of property taxes which are typically on the backs of stores (like Eisenberg's). I'm all for competition, but these laws are in place for a reason, even if they are rarely enforced. There's plenty of business out there for everyone, but let the food trucks show a little respect. There's no reason for them to set up shop right in front of an established food business, unless their intent is to antagonize. I don't think there's any reason that food trucks and restaurants can't coexist. The food truck trend seems to be just a further segmentation of the market, and competition like this invariably benefits the consumer (you). Previously, you had restaurants/delis and street carts. Now there is an option in between, with the convenience of the street cart and better food. I appreciate that ordinances are in place for a reason and should be respected. However, if restaurants have an issue with food trucks, it's probably because they're having problems covering their higher overhead. That either means (i) their food isn't good enough to justify the higher prices their business model requires or (ii) their rent is too high. So they should probably focus on improving their food or re-negotiate their lease, but complaining won't help.